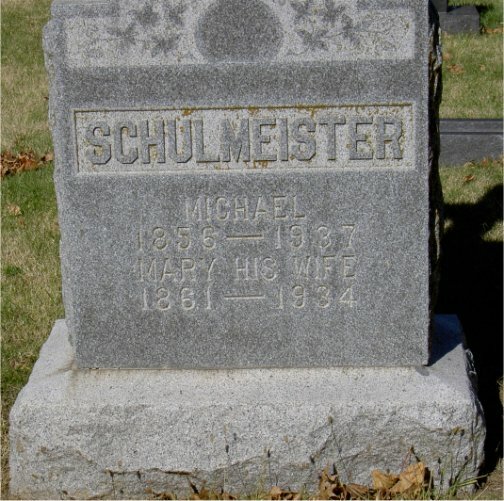 My 3rd great grandfather Michael Schulmeister was born in Russia about May 1856. Arriving in New York City with his wife Anna Maria (Mary) Kotterin Schulmeister on April 17 1886, they quickly set down roots in Topeka, Kansas where a large congregation of Volga Germans had settled. There they had at least five children, three girls and two boys. The oldest is my 2nd great grandmother Elizabeth Schulmeister Porubsky. Photo from FindAGrave.com by Oz. Michael died in 1937 in Topeka at age 81. He is buried in Mount Calvary Cemetery in Topeka.